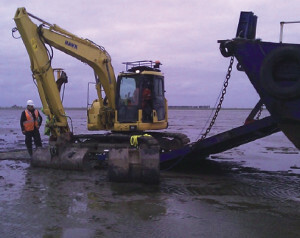 The investigation was carried out using In Situ’s mobile rams mounted on to a low ground bearing pressure excavator. 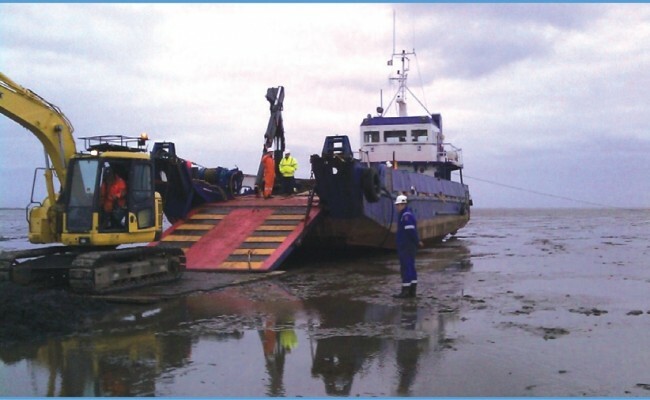 The survey consisted of carrying out one test per shift at low tide; when the water receded the excavator could be tracked around on the mud flats to complete the survey. 5 locations were tested along the cable route. Each location’s testing consisted of digging a trial pit to get samples and to view the material. A CPTU was then carried out to 5m followed by a Full Flow Penetrometer test to 5m. The Full Flow Penetrometer was used to measure the shear strength and sensitivity of the soils using cyclic testing.